If the news that Manchester 765 was to visit Beamish in time for April’s Great North Steam Fair wasn’t enough to persuade you to make a visit how does it sound if you added Blackpool & Fleetwood Box 40 to the offering? Well, that is exactly what is happening with 40 set to leave Blackpool for the last time for a loan period until August – and it will then head to Crich in plenty of time to play a starring role at the 60th anniversary celebrations there in September! It has been confirmed that the tram will be leaving Blackpool permanently (well, at least for the foreseeable future anyway) and will remain at Crich following its arrival there after its spell at Beamish comes to an end. Box 40 has been one of the better travelled trams in preservation and Beamish will become its fourth different tramway it has operated on – bringing it level with Blackpool Pantograph 167 (Beamish, Blackpool. Crich and Gateshead Garden Festival) and Manchester 765 (Beamish, Blackpool, Crich and Heaton Park) as the trams which have run on the most different tramways in the preservation era. 40 has previously run at Blackpool (extensively!) and Crich (1964-5 and briefly in 2014) as well as a period on loan at the Heaton Park Tramway in the 1980s but this will be the first time it has gone to Beamish where it will be the fourth tram from the national collection to operate there (following in the wheels of Cardiff 131, Blackpool Pantograph 167 and Glasgow 1068). The current plan is that 40 will make the road journey from Blackpool across to the northeast in early March. This will allow time for the tram to be recommissioned and also allow familiarisation for Beamish’s own engineers and tram drivers before it enters service in time for the Great North Steam Fair, taking place between 11th and 14th April. It is due to stay at Beamish until the end of August and if its spell of operation in the northeast wasn’t exciting enough it will then return to Crich where it is planned to be in service by the time of the 60th anniversary event to celebrate the discovery of the old quarry that has now become home to the National Tramway Museum. This will be the first time since 2014 that 40 will have run at Crich and the tram was one of the very first electric trams to run at the museum in its early days in 1964-5. For a tram owned by the Tramway Museum Society and which has run extensively elsewhere over the years it seems remarkable that these have been the only two previous periods of operation at Crich but this time it will be sticking around for a bit longer as it has been confirmed that its loan period in Blackpool (due to end at the end of 2019 anyway but cut slightly short to accommodate this loan to Beamish) will be coming to an end. 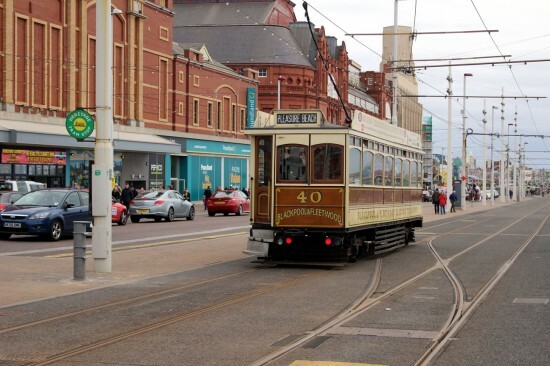 Although it will be met with disappointment by some that 40 will no longer be in Blackpool it should be remembered that it has had a good period of operation there and it is now time for the next stage of its preservation career to get underway at what is, after all, its home tramway. After a couple of years where the number of trams available for service at Beamish has been at a fairly low level the loan of both 40 (until August) and 765 (until June) will help to give plenty more variety of trams available to transport visitors around the site – and if that isn’t a good enough reason to visit then what is! The familiar surrounds of Blackpool for Box 40 on 22nd September 2018 with the tram operating on Heritage Tram Tours with a service to Pleasure Beach in a view at North Pier/Tower. Sights such as this will no longer be seen once the tram heads off to Beamish in early March. I have mixed feelings about the situation with Box 40, as its one of my favourites in the current operational fleet at Blackpool, and a nice change from Balloons and Brush cars! However, obviously its a TMS car and they can do whatever they want with it. The main annoyance for me is that last year Halle 902 moved to Blackpool for storage because Crich were desperately short of depot space – so what has changed since then? It feels like Blackpool helped to free up space at Crich so Box 40 could go back there! Very strange! I think its return to Crich for the 60th Celebrations is important given the part it played in early electric operations at the museum. It has had a good innings at Blackpool and perhaps it is time to ring the changes. Hopefully you won’t have to wait too long for its replacement in the form of the English Electric Series 1 railcoach 279 and also Standard 143 to provide a little variety. 279 and 143 are hardly comparible! No one said they shouldn’t bring it back – my point was 40 is a Fleetwood Tramroad saloon and unique, therefore aren’t comparable. 143 will certainly boost the ‘vintage’ pool. As the legal owners (well custodians) entirely its the Tramway Museum Societies prerogative to bring to an end the long term loan. It is perhaps a timely reminder about the perils and pitfalls of second party ownership though… When the Fylde Tramway Society resolved to release a % of the money as part of 2014 overhaul it did concern some in the room at the time the lack of long term security in terms of a rolling lease and that some of the commitments were not firmly on paper (who can forget the teasing tentative Dreadnought 59 Condition Survey thrown in to the discussions by a then Committee member…) Its departure naturally leaves a gaping hole in the story which will have to be filled in some form in future if its no longer available to be part of the unique collection amassed in Blackpool. I do not envy Blackpool Heritage Tram Tours been responsible for distributing tickets for its farewell tour as demand will surely massively outstrip supply. Its been obvious for some time mileage has been restricted as part of the 2014 agreements even as an observer. That been said when you look across to Beamish Museum currently running 31 out in Snow such is the tramcar availability situation their so from March to August potentially could be very very busy period for it. Taking all that into account I wonder how long it will have a operational role at the quarry perhaps it will find itself in the Exhibition Hall next to Rack 2 within a few years. A significant part of the thinking behind bringing 40 back to Crich is that as an enclosed, single deck, handbrake car it fulfils a business need. It will be the only enclosed single decker that all licensed Crich drivers can operate, and as such will be invaluable for those windy days where double deckers aren’t permitted past Wakebridge, which nowadays tends to result in a split service with something like 630 operating a Wakebridge to Glory Mine shuttle. So given this business need, and the fact it was only overhauled in 2014 I’d be very surprised if it was withdrawn any time soon. Thanks for injecting a bit of sanity into this topic. Since 40′s move was confirmed I’ve heard all kinds of rumours, including that it will be back at Clay Cross within a year… all possible, of course, but common sense suggests it is rather unlikely. Whilst I for one am sad that 40 is leaving Blackpool, we must remember that without the TMS it wouldn’t even exist as it would have been scrapped in the 1960s. 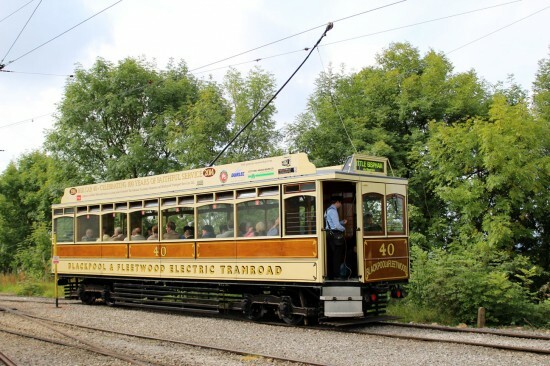 Also Blackpool & Crich both invested valuable workshop resources in the tram in 2014, since which time it has enjoyed extensive use at Blackpool but just three months of operation at Crich. Against that backdrop, I find it perfectly understandable that it is being returned to them, although admittedly the loan period being cut short (five years starting in October 2014, do the maths!) is a disappointment. As I posted earlier, I also find it a bit odd that space is available for it when Halle 902 had to go last year. I can see arguments on both sides about where 40 should be. Simple answer to that – train your drivers! New drivers at Crich start out on handbrake trams and go on from there, adding further classes onto their licenses as they gradually gain experience. Surely it’s obvious that to train new starters on every operational tram in the fleet with all the different control set-ups therein would totally overwhelm them? Without wishing to get involved in an argument over this, Crich do seem to labour this point. Whilst I appreciate that some cars are more complex (air interlock for example) the majority aren’t. Other museums train on handbrake, then upgrade to air within a few months. Cars like 167, 630, 273 have no great mystery to them! I think that we should be grateful to the TMS for such a long loan, which covered a period when the new heritage service was emerging and helped to add diversity to the heritage fleet when most needed. As mentioned elsewhere, this very heritage fleet is now expanding with trams such as 143 and 279 close to being ready to commission. Also, we have the exciting prospect of a Lytham car being restored and what a pleasure it would be to ride this to North Station along part of its original Layton route. Don’t forget too that 2023 will be the 125th Anniversary of the Blackpool and Fleetwood Tramroad; so 40 may return along with 167 and even Rack 2 for this occasion as in 1998, all depending on whether it is deemed a sufficiently important occasion to celebrate. Would it not also be wonderful if OMO 8 could also be ready for service, allowing a more complete line up for any cavalcade which might be planned? I think the future is going to be very interesting and sometimes it’s better to move on, rather than become to set in one’s ways. Wasn’t aware Lytham cars ran to Layton. Is that correct?